Dave’s back tonight, on two networks: Classic Letterman returns to cable channel TRIO at 10p/1a ET, and new Letterman airs on CBS tonight. Nice to see Dave back on TV! TRIO plans to air a Dave marathon on his birthday, Apr. 12. Snow caused power outages and school closings in North Carolina and Virginia. More details. Snow also continued to fall in northern and eastern New England. More details from USA Today and Weather.com. Weather window in Iraq closing fast? Well, the Major League Baseball season kicked off Sunday night in Anaheim, CA, and being from Dallas/Fort Worth, I was happy to see the Texas Rangers win. Since I’m in a happy mood, here’s a link to a Tampa-St. Pete site that is currently stuck on an image from earlier this month. Fortunately, as of early Monday, it’s stuck on a nice daytime shot of exhibition baseball. There was some sad sports news for many in Dallas/Fort Worth Sunday night, as Scott Murray hosted his last “Sports Extra” on NBC 5. Wintry weather returns to the Northeast today with snow (more than 6 inches in places) and a chilly bite! It even dipped to the freezing mark here in Fort Worth and Dallas overnight. Check out the snowfall forecast map, watches and warnings map and your city to see where the flakes could fall. SpaceImaging.com has a good satellite photo of bomb damage in Basra, Iraq. Get the latest Iraq forecast in this article, and get complete Iraqi war coverage in entries below, and in the National Weather & Webcams page. Severe thunderstorms could crop up this afternoon from Pennsylvania to North Carolina. This USAToday.com article has more info. Your city’s weather & webcams page will help keep you updated, along with the EarthWatch current watch/warning map and Weather.com thunderstorm forecast. On to Iraq, where a NOAA satellite has captured “hot spots” near Baghdad: Image and story. You’ve been waiting for it, and here it is: a 15-day Baghdad forecast! Actually, it’s been around for awhile, thanks to AccuWeather.com. Another cool page features a map of sand/dust storm potential over the next eight days. A quick check will show that in Baghdad, temperatures will dip into the 30s, but things could heat up quickly with highs reaching into the upper 80s by next week. Weather Underground has a good Baghdad weather conditions page. Check out Iraq’s average highs and lows for this time of year, and look for many Middle East weather links in the WXnation National page. Heavy Snow In MI’s UP; Severe WX In Midwest? Three years ago today, a tornado tore through downtown Fort Worth. More details here. Added: An interactive map of embedded journalists in Iraq. Michigan’s upper peninsula will see 8 to 18 inches of snow, while Indiana and Michigan will see severe storms, Friday, according to the Weather.com thunderstorm forecast. Additional details here. Here’s the current watch/warning map … High winds will continue in the West. On Thursday, tornadoes hit the Miami-area, killing one man and cutting power to thousands, and high winds downed trees in L.A..
A report on war weblogs aired on NBC Nightly News this evening, and led off with a cyber-friend, David Ackerly (aka. Cyber Paperboy). It’s great to see (through TV cameras) more of his Troy, MI automotive garage than what was available through a picture or two on the Net. I have corresponded with Ackerly via e-mail since being introduced by former co-worker Mike Wendland (another long-time Internet reporter and blogger). It’s great to see Cyber Paperboy on national news, especially NBC’s (since I work for an NBC station). Meteor Chunks Crash In South Chicago Suburb, Light Up Night Sky. Residents from four states report seeing the bright light, which a freelance photographer described as a bright flash that “turned midnight to noon” for several seconds. Additional information is in SpaceWeather.com’s homepage. Mapping Baghdad; Return Of Snow For Denver? Just added: Mapping Baghdad and Iraq, plus a Strikes map from NBC 5 Iraq page. Also, Satellite imagery from Iraq and stream from BBC Internet (heavy traffic is making page unreachable at times). Another round of snowfall (2-6 inches) is headed to Denver. Here’s a current Denver area radar loop, and get the latest forecast from TheDenverChannel.com … And rain is moving through some East Coast states. Here’s a national radar and current thunderstorm forecast. As for current Iraqi war coverage in the media, another source is CBC Newsworld, which some viewers in the U.S. may catch on satellites or digital cable systems. Its newscasts are available online, updated every hour. And Pulse 24 offers a 24/7 stream from Toronto. Many American news channel streams are located in WXnation’s National page. A country that neighbors Iraq has its own weather Web site: Islamic Republic Of Iran Meteorological Organization. Here’s a story on today’s sandstorms. Thunderstorm watches were posted this evening in parts of Texas, Arkansas and Tennessee: Watch/warning map and radar loop. Much more in your city’s page. Another aurora watch was posted today at SpaceWeather.com. Here’s an ominous AP photo of black smoke filling the Baghdad sky, Monday. High quality streaming video of the Baghdad skyline is at CBSNews.com (link in top right-center column). Others: MSNBC.com stream, and CNN.com also has a video feed for subscribers… NOTE: Some of these video feeds may periodically go down… More are in the National page and Mar. 21 entry below. You can follow other Iraqi news at FOX News, MSNBC, CyberPaperboy and Feedroom. Other interesting sources: Iraq Blogger Where Is Raed?, and if you can get in (high traffic is giving a “page cannot be found”) Al-Jazeera has an English version of its site. On another topic, it’s finally Paul’s turn. Paul Shaffer hosts the Late Show With David Letterman tonight, according to its site. Bob Dole is the first guest, and a good one too! Many in the Denver area are able to leave their neighborhoods for the first time in days following the worst snowstorm to hit that city in 90 years. More from CNN.com and TheDenverChannel.com. Thousands remained stranded in their homes, USAToday reported Saturday. Spring Outlook: Floods could threaten parts of the South and East, The National Weather Service said. A drought may continue in the West as well. Iraqi Weather, Nice Weekend In U.S.
Here’s a weather forecast for Iraq posted at USAToday.com, updated Sunday. If you live along parts of the East Coast, you may see severe storms today, according to Weather.com’s T-Storm Forecast. A flash flood watch remains in effect for much of New York State, and other parts of the Northeast. Here’s EarthWatch’s watch/warning map. The vernal equinox arrived at 8 p.m. ET last night. SpaceWeather.com has more on this, and on auroras, likely visible tonight in Michigan, Wisconsin and Canada. I’ll be brief today since last night’s post has the Middle East info many people want… A tornado has killed 6 and injured more than 200 in SW Georgia, and severe weather continues across parts of Georgia and Florida. Here’s a radar loop of the area, and more images from Savannah … Flooding is expected in the East and storms in the Midwest: More details. 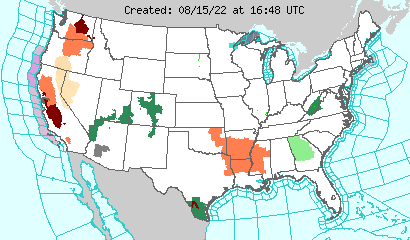 Also, check out current watches and warnings and radars/cams for your city. Americans have been getting used to something new — Iraqi weather forecasts. Back in 1998, one person went so far as to create a Baghdad webcam hoax. Live webcams are available in Israel. Check out the Western Wall, Cam 2, Messiah Cam, and Beach Cams. Other live web cams in the region include: Tehran, Iran, Karachi, Pakistan, and a streaming webcam from Dubai, UAE. A list of other regional cams is at this EarthCam page. Additional world cam links are listed in WXnation.com’s National page. Some other sites and links of note: EarthViewer and Story/Links to Views of Planet Earth, plus a World Clock, featuring Washington, DC, London and Baghdad. Here are some satellite photos of Iraq and Kuwait, updated daily by Chuck Watson. More Iraq links are in Mike’s E-Journal. Live streaming news coverage is available at Pulse 24 Toronto News (link in right column). Other video reports are in The Feedroom. Part of Tennessee, Alabama, and Georgia are under a tornado watch. Check out the latest warnings and a radar loop of the region. IRAQ: Here are some satellite photos of Iraq and Kuwait, updated daily by Chuck Watson. Middle East cams are in yesterday’s weblog entry. More Iraq links are in Mike’s E-Journal. Severe weather is approaching the Houston area (as of noon CST). Here’s a regional radar loop. … A tornado was reported Monday about an hour west of Fort Worth, and others were spotted southwest of Oklahoma City and in south Florida. The possibility of tornadoes and severe weather continues today in parts of Texas, Oklahoma, Arkansas and Louisiana. As troops in the Middle East wait word for word from our president (more here), Americans have been getting used to something new — Iraqi weather forecasts. A webcam project titled Webcam in Iraq is underway at webcaminiraq.org, but live pics are not available. One person went so far as to create a Baghdad webcam hoax back in 1998. Webcams are available in Israel from the Western Wall, Cam 2, Messiah Cam, and Beach Cams. A list is at A Bird’s Eye View Of…. Other world cams links are listed in our National page. Outside of this world, watch for Northern Lights and Moon Rings, according to today’s front page at SpaceWeather.com. Severe weather is being reported in the plains and Florida. Check out the WXnation.com city page nearest you, and also check out: Plains regional radar and Florida radar, track warnings with EarthWatch StormWatch Map, IWIN Warnings Page, Weather.com Severe Weather Alerts, NWS Watch, Warning, Advisory Display, and LightningStorm.com US Map for lightning strikes.